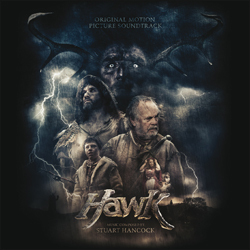 Stuart Hancock's score for Hawk is a thing of pure beauty. This took me back to some of the classic film scores of the '80s (the movie even has a classic '80s Drew Struzan-esque poster by Dave Gaskin). There's a little of John Williams's music from Raiders of the Lost Ark, a sprinkling of Jerry Goldsmith's The Secret of N.I.M.H; a touch of James Horner's Willow; and a taste of Trevor Jones's wonderful score for The Dark Crystal woven through this soundtrack. It's not that this sounds like Hancock has "borrowed" from these scores, more that they feel very similar in essence. It's pretty obvious that Williams's is a huge influence on Hancock's work. This isn't the first time I've come across Hancock's work. Back in 2009 I reviewed his scores for Underground and Bodyguard: A New Beginning, and then last year (2010) I was lucky enough to review his work for One Night in Turin. All of those albums, like Hawk, hark back to a bygone era of classic (for me) '80s movie soundtracks which seems to be lacking in a lot of modern scores. It's quite a short soundtrack, coming in at around 35 minutes when you've excluded the rather odd 'The Legend of Pwyll, Prince of Dyfed' reading at the end of the album. But there isn't a note wasted. There are powerful, beautiful themes ('Flight of the Hawk', 'Revelations' and 'The Rising Soul') as well as a number of eerie, atmospheric tracks ('A Hunter of My Own', 'Torrit Mynudawl (The Wild Hunt)' and 'The Seed Falls'), and as a whole this is destined to become a classic score - every bit as incredible as David Shire's surprise score for Return to Oz. In essence, this soundtrack neatly encapsulates everything that got me interesting in soundtracks in the first place. Hancock is a bloody genius... and I'm enjoying listening to him blossom.